Repair work is a deeply timely affair. The language that we use to describe repair action evokes important senses of rhythm, duration and precedence. For example, the value of the bodge, or kludge is in producing an improvisational fix that will hold within the immediacy of the situation. On the other hand, restoration implies work of a longer lasting duration; it also communicates a sense of precedence, as orienting towards a prior form or state. The language of repair reveals taken for granted temporal ontologies, which ground repair and make sense of breakdown. My Mother often repeated the 18th century English aphorism “a stitch in time saves nine” as she mended and patched three boisterous daughters before we unravelled entirely. Here, repair is understood as an expedient intervention into a world that decays inevitably along a linear trajectory. 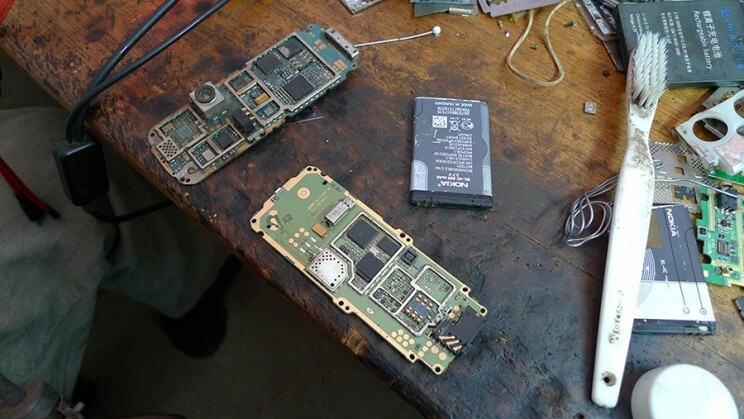 This short paper explores the temporal dynamics of a particular category of repair work, namely the livelihood maintenance and mending of mobile phones in Kampala, Uganda. As Denis and Pontille describe in this issue, a common configuration of repair labour involves professional technicians being employed to maintain systems or objects in order to keep them working and unproblematic for their users. In this mode of ordering, objects are enacted as ontologically stable most of the time, with breakdown appearing to be an exceptional event. Where the ontological stability of objects or systems is foregrounded, repairers’ work tends to recede. If breakdown is exceptional, then so are they – their labours need to be marginalised to sustain the (illusion of) the basic stability of objects or systems. Read more at Continent. or download PDF.